It was in May of 1914, in Oyster Bay, Long Island, that Mr. Louis C. Tiffany invited to one of his famed dinners,150 of his stuffy (male) friends to Laurelton Hall, his magnificently gilded mansion. The evening opened with a parade of young women and children bearing bouquets of peacock feathers and carrying silver platters of the roasted birds. It was as lavish as it was decadent. Misogynist, too. It was his Peacock Feast, a pageant, and its spectacle was reported, with photos, in the New York Times. So begins an elegiac story that spans almost a century. Lisa Gornick, as a writer and a psychoanalyst, beautifully reveals the natures of a host of characters: rich and poor, drunken and abstemious, impulsive and cautious, artistic and crass, and those who are noble though not of nobility and those of (mostly American) nobility who are far from noble. She gives us a four-generational tale that begins and ends with hope. The travels along the way are like those of so many a family’s, where loves are realized and loves lost, with divisions and attachments, the merciless march of time, the randomness of fate, the collection of losses, and the ineffable, insistent bonds and woeful fractures of family. 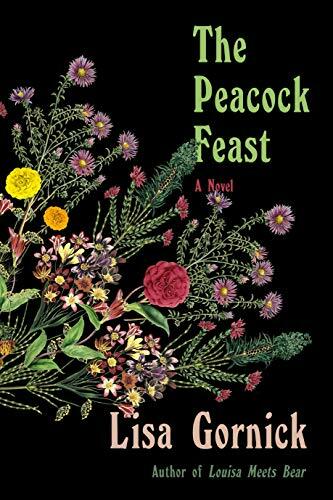 The Peacock Feast does not follow a linear narrative line. We go from chapters told in the early 1900s, to the ’20s and ’30s, to the ’60s and ’70s, to the current century—just but a few years ago. And the stories are not told in that order; they are like switchbacks in an ancient forest. In settings as divergent as Oyster Bay; New York City; London, with a visit with Freud’s daughter, Anna, and her life partner, Dorothy Burlingham (a divorced New York socialite); Mendocino, California; and L’Isle-sur-la-Sorgue, France. The novel’s thick vines connect people and their stories, thereby firmly joining times and places; they offer the reader the adventure and pleasure of following their tangled paths. The story is deeply rooted by two characters: One spans the novel, Prudence (Theet, née O’Connor), the creative daughter of a Tiffany family gardener and housekeeper who makes a life in interior design. The other is Prudence’s brother’s granddaughter, Grace (O’Connor), who enters later in the plot. She is a hospice nurse attending a conference in New York, where Prudence is living. Grace pays Prudence an unexpected visit and delivers to her a brass-clasped, wooden box whose brimming contents, including artifacts, letters, and photos, evoke decades of memory. It is as if its magic spell has opened the doors, late in life but not too late, for Prudence to claim herself, to redeem the life that she had let herself lose. In so doing, Prudence also rekindles life in Grace. Think about their names, as Gornick suggests we do: Prudence and Grace. When you do, you will see all the better into the soul of the story. Grace has a twin brother, Garcia, both she and he named after ’70s rock stars by their hippie parents. It is Garcia’s story that adds an awful tempest, a lasting roil to the choppy seas of Grace’s life—and to that of both her and Prudence’s families. Garcia’s life became an awful tragedy, in part because the devastation stemmed from Garcia’s noble guilt. His story also is the anchor for the moral message of the novel: It is sorrow that is the price of walking away from life and love, Gornick writes, gently underscoring that retreat is the greatest of sins. So much so because we ourselves have brought upon or sustained that sorrow, with its aching and unnecessarily unremitting pain. A great novel, which this surely is, transports us through time, place and into the souls of its characters. This great novelist uses her fictional (yet all so real) people to furnish the reader with the experience of an unsettled anguish that cries out for resolution. Fate may grant us the good fortunate, the opportunity, for a release from our self-generated fetters, as it does for Prudence and Grace, which is like a blessing. It is an opportunity, dare I say, for grace. Yet too often the occasion for release is not seen (or not pursued), even though it may strike any of us like a stone kicked up as we walk the road of our lives. You will be deeply moved. You may cry at the end of this novel. Gornick has given her readers a tale suffused with pathos and moral imperative, which tugs kindly and powerfully at our hearts. When a seemingly random moment or event bruises our psychic shin just enough, it stands to become mutative. But only because we dared to allow its impact to stir us, to move us off what had been an unbending, quiet grief, to head, instead, toward the light we had not yet seen. LLoyd Sederer is a staff reviewer at New York Journal of Books.